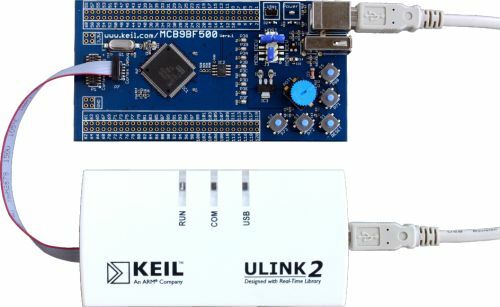 Connect the ULINK to the JTAG connector of the MCB9B500 Board. Note that the red tracer on the cable marks pin 1 of the JTAG-connector. The JTAG interface could be disabled by random CPU instructions or by the power-down mode of the device. If this occurs, enable the on-chip boot loader, so the MB9B50x device can execute a valid program. Power up the MCB9B500 Board. Set the Use Target Driver for Flash Programming option, then select the ULINK Cortex Debugger as the Flash programming tool. Set the Start location for for the flash programming algorithm to 0x2000000 in RAM and set the Size to 0x0800. Click the Add button and find the MB9BF50x 256kB Flash programming algorithm in the list of available algorithms. Select it, then click the Add button to add it to your target. Finally, click the OK button to save the Target Driver settings, then click the OK button to save the Options for Target dialog settings. Click the Download to Flash toolbar button. This executes the Flash download program (Target Driver or External) selected in Project — Options for Target — Utilities and downloads the application program into the MB9B500R device. Use the µVision command Flash — Download to download the application program into the MB9BF500R device. ULINK can be also used for application code debugging in Flash ROM or RAM of the MB9B500R microcontroller.